Jasmine, Ariel, Merida, Tiana, Snow White, Rapunzel, Cinderella, Belle, Aurora, Pocahontas (Her dad was Chief Powhatan), Mulan (who isn’t a princess or related to one but often marketed as one). Alice in Wonderland, Mary Poppins, Fairy Godmother, Tinker Bell and the Tremaine family also represent strong female lead characters who appear in their human form. This past weekend, in the Walt Disney World’s Magic Kingdom, Disney introduced its newest princess. Her name is Sofia the First. 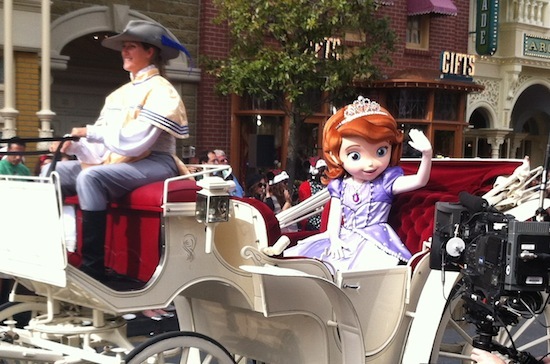 Sofia appeared in character form for the first time in Saturday’s filming of Disney’s Christmas Day Parade that will be aired on ABC on Christmas Day. Will this soon lead to Sofia appearing in Disney’s theme parks? Handy Manny first appeared in the same parade in 2006, but didn’t appear for meet and greets in Hollywood Studios until 2010. There’s no word when or if Sofia will begin appearing regularly. Sofia will be part of an upcoming Disney Jr TV series of the same name that premieres in January 2013. The series was given a special introduction on Nov. 18 a one-hour special. Sofia is a girl who comes from an ordinary background and is thrust into her new role as a princess when her mother marries the King Roland II of Enchancia. King Roland already has two children that become Sofia’s step family, their names are Amber and James. Sofia is trained in her new royal role by three characters who should be familiar to Disney fans, Flora, Fauna and Merryweather (The same fairies who assisted Aurora during her time in hiding as Briar Rose in the movie Sleeping Beauty.). In addition to the three fairies, Sofia is given a royal steward named Baileywick. While using a magic amulet to communicate with animals, a nod to Snow White, she must learn the princess graces of loyalty, kindness, honesty and generosity. Let’s hope it doesn’t take four years for her to begin appearing in the theme parks! *Error – It was 2007 when Handy Manny first appeared at Hollywood Studios. 2010 is when he took over in Hollywood and Vine character meal. Apologies! I DONT LIKE IT AT ALL IT’S SO STUPID AND IT TEACHES KIDS TO DATE PEOPLE LIKE THAT BOY WITH THE TOWEL ON HIS HEAD IS IN LOVE WITH SOFIA AND PRINCE JAMES AND ROLAND THE SECOND ARE JEALOUS OF HIS KINGDOM!!!!!!!! Please were can my 3 yrs grand daughter meet and have tea party dress up with Sophia as seen on t.v. Were can my three year old grand daughter meet sophia as seen on t.v. for a party dress up .please let me.thank you.